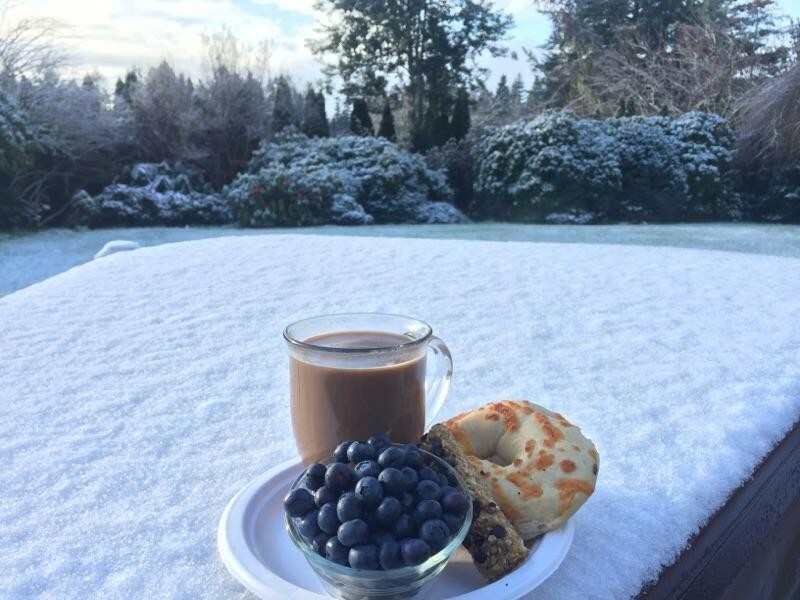 A breakfast view of the snow from Fortuna. If you woke up to snow or hail on the ground, you're not alone. 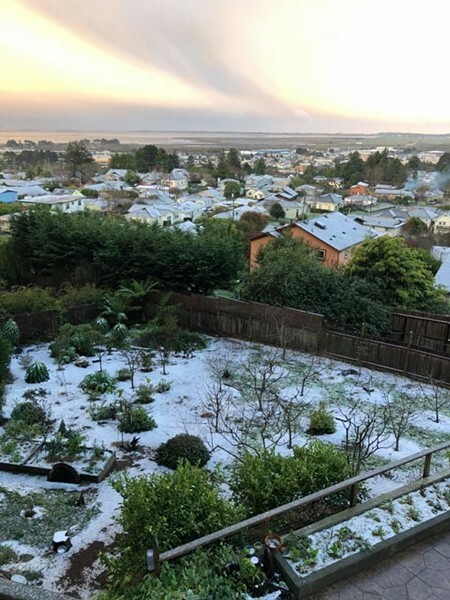 Humboldt residents from Piercy to Willow Creek saw their fair share of the white stuff, with snow even dusting the ground at sea level, according to the Eureka office of the National Weather Service. "We even had snow down at the office on Woodley Island," lead NWS meteorologist Matthew Kidwell told the Journal. Meanwhile, a high surf advisory is in effect until noon with waves up to 24 feet. Kidwell said the largest amount of snow appeared to have fallen on the Ruth Lake area, with reports of 5.5 inches. Wilder Ridge, near Honeydew, received 3.6 inches and Kneeland saw 3 inches. 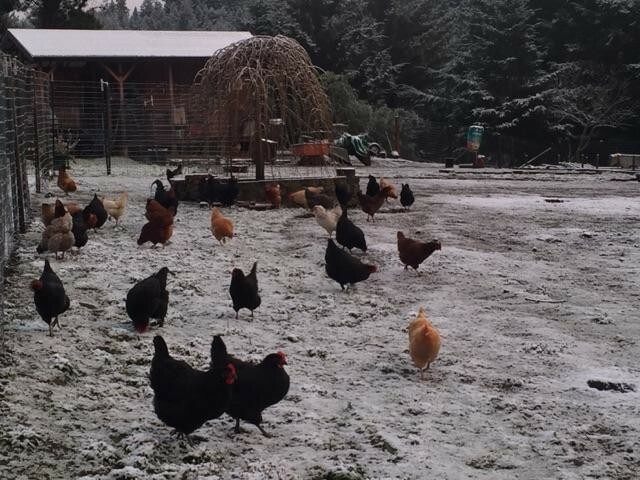 "It's pretty unusual to get snow right down to the coast," said Kidwell. "I would say it's every few years. Last winter we had a system that was almost this cold but not quite." Driving conditions have been impacted by the weather, with hail contributing to a multi-car accident in Arcata last night. Colder than normal temperatures are expected to continue for at least one more day with another hard freeze warning on tap for tonight into Tuesday morning, according to the National Weather Service. Kidwell warns that will only exacerbate this problem, creating conditions for black ice on the roadways. 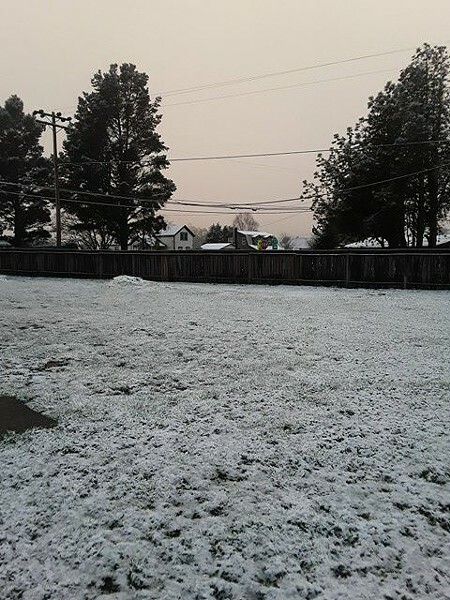 Yesterday, Eureka saw a high of 48 degrees and a low of 35 degrees, compared to the normal average of 56 and 42, respectively. The record high for the day was 72 degrees set in 1902 with a record low of 29 degrees logged back in 2006. According to the weather service, low temperatures in the 20s are likely tonight in the inland areas — Willow Creek is forecast to get down to 19 — while coastal areas are predicted to skirt the 30s. With temperatures falling this low, the lives of people and animals are at risk. It's a good idea to bring your critters in for the night. And if you know someone who is sleeping rough, direct him or her to the emergency weather shelters that are available in most towns. Things are projected to begin edging back into the normal range over the of the course week with scattered showers through Thursday before sunny skies return on Friday followed by another chance for showers this weekend. Bring your pets inside tonight. Hydesville saw about an inch of snow. Early gardens and fruit trees in Arcata got a shock last night.